With the proper software installed on your Droid X, your phone can also be used as a radio. Whether you’re in the mood for good old FM radio or something from the Internet, your Droid has you covered. Plug a headset into your Droid X. If you forget, the app reminds you. 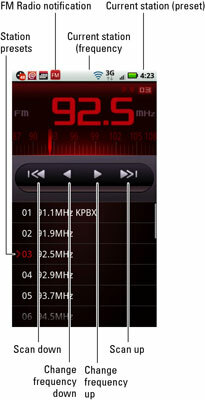 Choose the FM Radio app from the Applications Tray. The first time you use the FM Radio app, you’re prompted to scan available stations. Touch the OK button to scan the stations. The Droid X scans all FM frequencies and makes note of which are active. If you want to listen to the FM Radio app over the Droid’s speakers, press the Menu soft button and choose the Loudspeaker command. But remember, the FM Radio app uses the headset as an antenna. If you unplug the headset, the FM Radio app closes. To quit the FM Radio app, press the Menu soft button and choose the command Exit FM. After the FM Radio app does the initial scan for radio stations, you can use the app to listen to broadcast FM radio on your phone. Use the controls on the app’s interface, as illustrated in this figure, to change stations or scan for new stations. Pandora Radio: Lets you select music based on your mood and customizes what you listen to according to your feedback. The app works like the Pandora Web site, in case you’re familiar with it. StreamFurious: Streams music from various radio stations on the Internet. Though not as customizable as Pandora, it uses less bandwidth. Both apps are available at the Android Market. They’re free, although a Pro version of StreamFurious exists for a price.